Why is everyone leaving healthcare? Episode 8: Burnout – where is our profession going, why is everyone leaving, and being able to get hired any where it the right resume and cover letter! 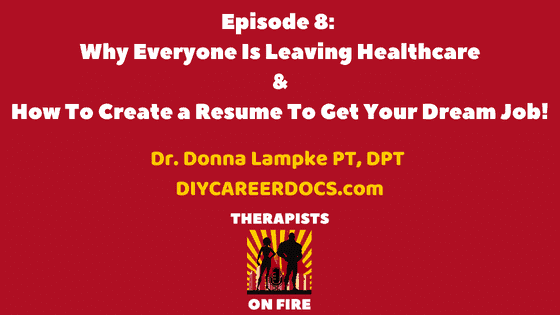 Dr. Donna Lampke shares all this and more in this episode! Donna has made many free resume and cover letter resources for therapists and you can check them out at her website. 1:00 The change in healthcare and burnout – everyone is struggling with work life balance. Healthcare workers no longer feel valued – we value our patients and our work but we aren’t valued as professionals. 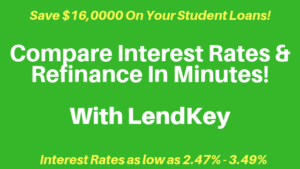 Discrepancy with pay: Graduating with high student loans but being unable to pay them off. 4:33 Why is there such a pay discrepancy – likely cause is supply and demand. 7:50 Older professionals are no longer in the work force but this limits the younger therapists understanding of how therapy should be and how productivity should be. There is not the mentorship that there should or used to be. 8:40 Why is experience no longer valued? The business model is more about efficiency than outcomes. 10: 10 We go into therapy because we are people people. But the model prefers efficiency and this model causes burnout. 15:40 Focus on the quality of therapists. If we have more quality therapists this will drive up our value and we will be. 16:17 As we learn to listen better we will help more people and that will reflect better as therapists. Patients can tell that we are hurting. 17:45 Rise in cash based therapy because people want more one on one care. Improve your documentation time and try to do less and more efficiently. What actually needs to be on the documentation. Recognizing the ethical boundaries and when things are no longer about patient care. 22:05 Creating an outstanding resume to always get the job! Resumes are about showing the employer your skill set and what you are capable of doing. 24:00 Proactively find the skills and jobs to get you to your desired position. There are now hundreds of resumes per job and so they look at key words, zip codes near the job. Be strategic when you are doing your resume. Skill set should be hard skills and skills in the application not soft skills. Tell examples of leadership and specific skills. 33:24 Having a resume and cover letter is extremely important. These are the first 2 things that anyone sees so you have to make this really great. 34:30 You have to be on LinkedIn and have a profile that is consistent with your resume. 35:00 Employers want to hire people that their employees know and can vouch for. 38:00 Adjust your resume and highlight your particular skills per each resume. Take out the jobs that aren’t related to the job application. 38:50 If you don’t hear back from your job application then likely your resume has gotten kicked out from the applicant tracking system. 3 legs: make a clean social media presence, basic resume that you can easily customize per specific job and just simple add or delete jobs as you need, and a cover letter that tells your story. 45:30 You have to reverse engineer your resume to get your dream job! 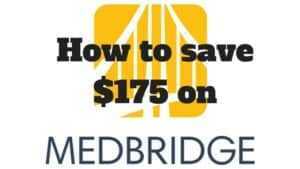 49:50 Advice to healthcare professionals: Always be ready for that next opportunity. Have an updated cover letter and resume yearly. You want it ready to go and you don’t want to miss out on that golden opportunity. You can beat the caring out of anybody! You have to care about your patients but also your employees. Lean management peer review actually found that patient satisfaction and employee satisfaction went down in this environment. We are great communicators but when we are busy that gets lost.